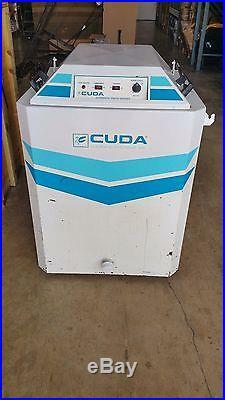 Cuda Automatic Parts Washer Model 2412 For Sale. 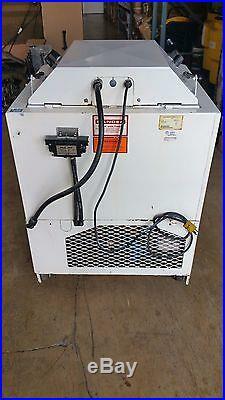 This is a 120 volt single phase unit that use a standard 120 volt plug. We had the Cuda 2412 serviced to determine it's condition. In the service the technician checked the heater, jet pump, automatic low water shut off, turntable, wash cycle timer, relays, top load door struts and turntable. All checked out and operated well except the gas struts which hold the top loader door open. They where weak and wouldn't hold the door firmly open. We had them removed and replaced with new struts. This machine can be demonstrated here at our facility in Miami upon request. We will put on a pallet and strap down for free. 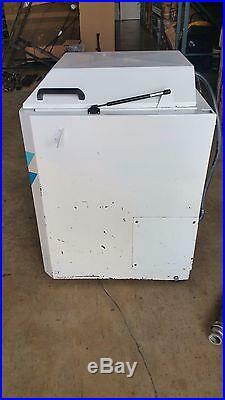 Dimensions 32" wide x 32 " deep x 45 tall- does not include pallet. Our zip code is 33186 Miami Florida. Estimated weight is 424 pounds. If you feel that your experience with us was anything less than 5 stars please let us know. Please choose carefully when time is an issue. By purchasing you agree to all of the following. In the rare event of any further delays or backorders we will notify you with the option for a "no questions asked order cancellation". Please select your carrier wisely, lower prices do not always guarantee "Good Service". For an estimate of these charges, we suggest you contact your local parcel carrier office or local government. We will not mark any items as gift or sample. Make a wise choice before opening. If any item is installed or removed it is not returnable; would you want us to send you something somebody else already opened or installed? If we see any concerns with your order we will notify you. If we do not receive any replies within 5 days we reserve the right to cancel your order. Like a regular paper check, an eCheck may take 3-5 work days to clear. The time it takes to clear is more time added to process your order. Feedback is important to us as we know it is to you. 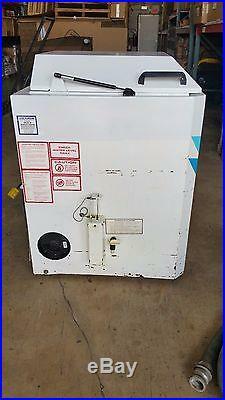 The item "CUDA Parts Washer Commercial Top Load Model 2412" is in sale since Thursday, February 04, 2016. This item is in the category "Business & Industrial\MRO & Industrial Supply\Cleaning Equipment & Supplies\Other Cleaning Equipment". The seller is "cssbinc" and is located in Miami, Florida. This item can't be shipped, the buyer must pick up the item.